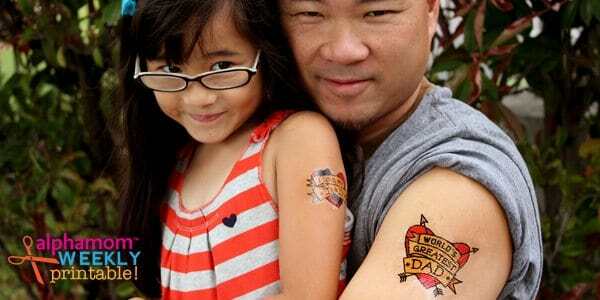 I Love Dad Temporary Tattoos for Father’s Day! Surprisingly, temporary tattoos are pretty easy to make. Tracking down the temporary tattoo paper is a little harder. You can buy it online and find it in fancy boutique stores. Here are the two I bought via Amazon, which pretty much are the same in terms of quality: Silhouette Temporary Tattoo Paper. 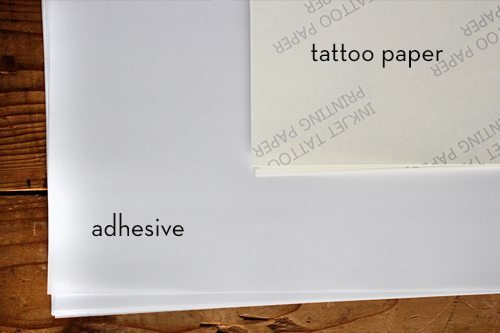 All you need is an inkjet printer, temporary tattoo paper (see above) and the clear adhesive that comes with it. You can follow the directions that come with the temporary tattoo paper pretty easily but we’ll break it down here too. 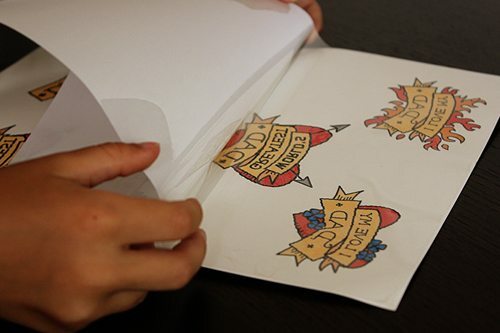 The temporary tattoo paper will be printed on the back. This is what you need to put in your printer. Depending on how your printer prints (see your printer’s directions) you’ll insert the paper’s printed side up or down so that you can print on the unprinted side. Does that make sense? If you aren’t sure put a small “x” on a blank piece of paper and test your printer to see if it prints on the top or the bottom (printing direction). 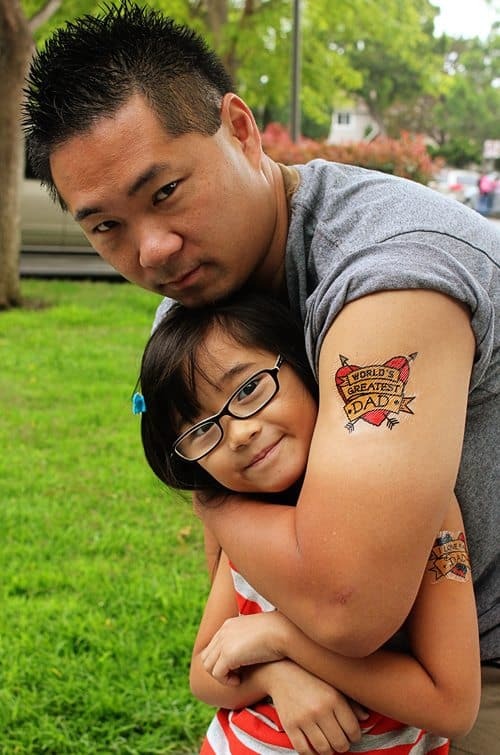 Next you can click and download our handy Father’s Day Temporary Tattoos Printable and print it out on your temporary tattoo paper. 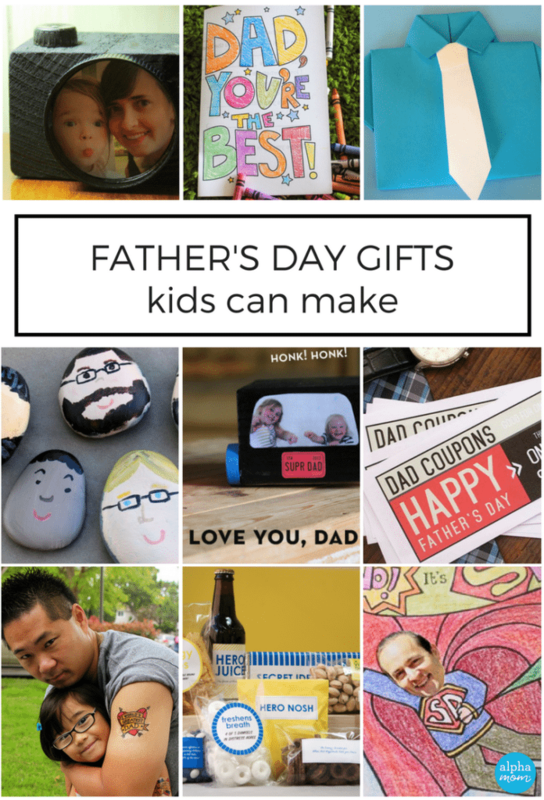 It has both “World’s Greatest Dad” and “I Love Dad” on one sheet. The next step is the trickiest part, but don’t stress about it too much. 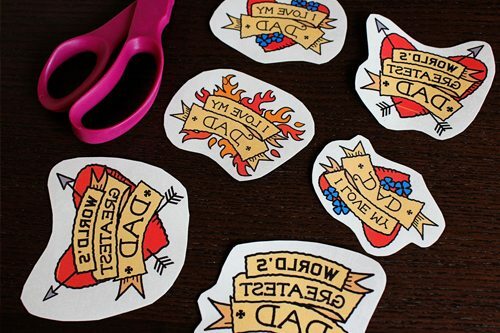 You are going to apply the adhesive over your printed temporary tattoos. The adhesive is kind of like a clear sticker. You separate it from its backing and gently line up the top edges with your printed temporary tattoo paper. Then pull the backing off and stick the clear adhesive to your tattoo paper, working your way downwards. The directions will tell you to be careful to smooth it out so you don’t have air bubbles. That’s pretty much impossible. There will be air bubbles unless you are some kind of master wall-paper-paster or something. Try not to get air bubbles but if you do have some, you can work them out later when you cut your tattoos into separate pieces. Like so! Now you’re ready to apply the temporary tattoos. The best way to apply temporary tattoos is to peel the clear adhesive off, stick it on your skin where you want your tattoo to sit and then dampen the paper with a moist paper towel. Hold down the wet paper towel for 30 seconds. If the tattoo paper isn’t covered by the wet paper towel you can do it in sections. Just make sure that the entire tattoo gets covered. We like to sing the alphabet song while we dampen the tattoos so that the applying time goes by faster. Please do not quote me on this one, but I think Michaels carries temporary tattoo paper. It should be in the aisle with the t-shirts and the image transfer paper they have there.